Have your home, condo, investment property, or townhome properly evaluated by a professional Realtor, Active Real Estate Investors, and Economist that's familiar with the current market and where it's headed. The more education you obtain prior to selling one of most people's most valuable assets, the more accurate and powerful your selling decisions become. It's vital to know where the market and local economy is headed and how to take advantage of market fluctuations before developing a listing plan and pricing structure. Our comprehensive analysis goes in-depth to provide what you should expect our local market to be like during each step of the selling process. From comparable sales data to individual property features, we break the process down in simple, understandable terms. We provide a complimentary and thorough case by case home value analysis. Please allow 48 hours turn around time for us to conduct the proper research and due diligence. A Buyer Pipeline from my bi-weekly "Local Home Tours"
I'm always studying marketing... online and offline marketing. It's a personal interest of mine not only for business purposes, but it intrigues me how particular systems and language can help invoke emotional responses that trigger "buying mechanisms" in the human brain. Many people believe that marketing is advertising. It's about placing AD's in newspapers and handing out flyers, but marketing is really about interpersonal communication. The dialogue between a reader and a writer and the message of the presentation. I believe marketing is always evolving, but I also believe key factors are in place that remain true and constant in our social world. We want emotion. Buying real estate for people is an emotional event. Addressing and interacting with those human emotions is what makes marketing powerful. By studying what "really works" in copywriting, marketing, and the psychology behind why we buy, it's made me a more effective Realtor. I continue to study Dan Kennedy, David Ogilvy, Jay Abraham, Bill Glazer, Eben Pagan, Mike and Tom Ferry, and my personal mentors with a desire to always improve in an ever changing marketing universe. Face it, you probably found this website and are reading this because of my online marketing or a combination of offline and online marketing which together really sync up as an effective pair. The National Association of Realtors (NAR) conducted a study to find that more than 90% of home buyers start and evolve their search online. 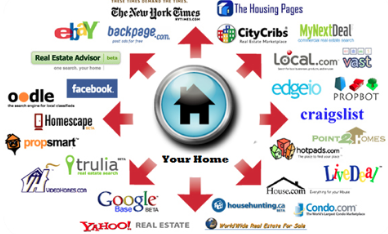 Having a firm grasp on online marketing and how to expose clients' homes to the right audience with effective pictures, descriptions, and elements that accurately represent the home is key to gaining interest, which produces more showings, and finally delivering offers that end up as successful closed sales. My team uses a proven complete online presence to provide video, image, and interactive social presence of your home. I'd like to go into more detail with you in person to more effectively demonstrate how effective I am at selling homes in Orange County. For a "no obligation" and "no bs" consultation on how I can help you sell quicker, painlessly, and for top dollar, Call Me at (949) 533-1572 or E-Mail me. I'm sure you know the more eyeballs that see your home for sale, the more likely you are to sell your home. This practice is easier said than done. I conduct my special "Tour of Homes" which is a quick tour of the best homes for sale in the local market to a group of very interested buyers. All my listings are included in these local tours on the weekends. We will have several eager buyers go through your listed home in a laid back setting without traditional high pressure sales tactics at typical open houses. My Tour of Homes not only gives us incredible buyer exposure, but valuable feedback on the home's presentation and features. In addition, I will include many high quality photos and videos to represent your house with our best foot forward, even before a buyer steps inside. I utilize my extensive know-how in real estate marketing to effectively sell. For your free consultation on how I may be able to help you sell the "right way," call me directly at (949) 533-1572.